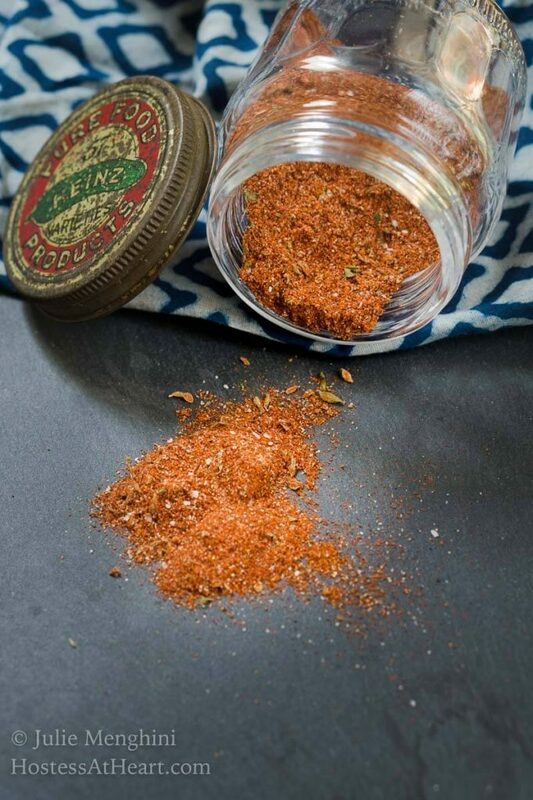 This Homemade Blackened Seasoning Blend recipe is a delicious mix of herbs and spices. It’s guaranteed to bump up the flavor. It’s great on meat, fish, veggies and in soup. This Blackened Seasonings mix has a great flavor followed by a nice kick. This post was updated 1/9/19 to improve the reader experience. There were no changes made to the recipe. Why do people make their own spice blends? You can find about any blend of spices already put together and conveniently bottled at the grocery store right? Trying this Homemade Blackened Seasoning will be the last recipe you try before you make it your own. If you’ve never visited New Orleans you’ve really got to do it. I heard stories of all the craziness long before we made our first trip to the Mardi Gras capital of the world and to tell you the truth I was a little nervous about going. I’d heard a lot about the antics and didn’t know if I would make a fool of myself reviving my crazy ways or what. As it turns out the city has something for everyone and we just fell in love with the people and their culture. We went to some amazing restaurants and ate some dishes that I didn’t have a lot of experience with. One of those dishes was fish with this deep dark spicy crust covered in a lemon butter sauce. I’m sure my veins are clogging just thinking about it. I may have licked the plate (guilty not guilty). As a result, we’ve been using a lot of blackening seasoning. It’s our go-to flavor for grilled fish and shrimp. You can find a dozen different kinds of Blackened Seasoning Brands. I know because I’ve bought several. They were either so hot that it’s the only thing I could taste or so salty that you balloon up after eating it. It wasn’t easy finding a seasoning blend that we both liked This one was definitely the winner! It has a lot less black pepper and salt than what you’ll find in some commercial blends. What kind of seasoning is blackened? Blackened seasoning is associated with Cajun or Creole cooking. It’s said that it was made popular in New Orleans Louisiana by the late Chef Paul Prudhomme. He was known for dipping food in melted butter and then dredging it in seasonings. The food was generally fried in a cast iron pan which gives it that charred, black crusty appearance. Blackening seasoning is a blend of herbs and spices. The red appearance is the result of paprika and cayenne. This blackening mix is delicious and definitely has a spicy kick. 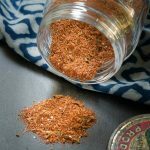 Why should I make my own seasoning? You can control the ingredients. A lot of commercial brands include preservatives and anti-clumping ingredients and can have a large amount of sodium. John loves a lot of heat so I can adjust the ingredients just for him (think flame thrower). I like mine milder (wimp comes to mind). To add heat add more ground cayenne pepper, not chili powder which will change the flavor. You know exactly how fresh your seasoning is. You can make it up ahead of time or as you need it. 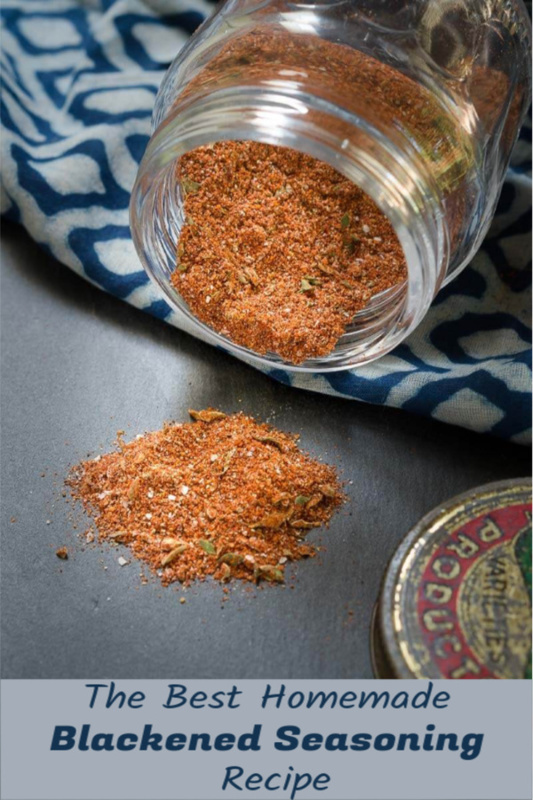 Making your own spice blends are less expensive and use spices that you usually have on hand. What are the ingredients in blackening seasoning? There are no standard blackened seasoning recipes. These are the ingredients I use and please note that they are all dried and not fresh. How do I use Blackened seasoning? Food is dipped in butter or oil and then coated heavily with the blackened seasoning. The food can be fried or grilled. Don’t move the food in the pan until it develops a coating from the spice. This will keep that coating adhered to the food. Spray food with cooking oil so the seasoning will stick when you apply it. If food is on a baking rack there is no need to turn it. Use blackening seasoning in soups or stews such as gumbo. Add seasoning to vegetables, rice, pasta, and sauces. You can add oil to your spice mix and use it as a marinade or lightly spray or rub your meat with oil and use it as a dry rub. Store spices in airtight containers. Any time you cook food with a spicy seasoning make sure you do it in a ventilated area. The strong spicy aroma can affect your breathing. SimpleHouseware 12 Square Spice Bottles w/label Set – I keep these jars on hand and I put dried herbs and spices in them as well as my spice blends. 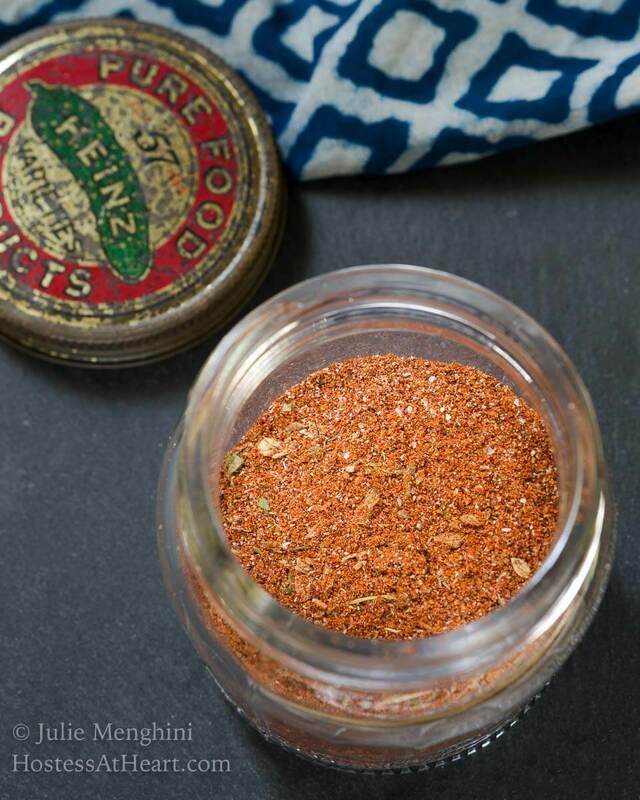 If you love this recipe, you’re going to love making your own Taco seasoning and Spice Rub recipes too! This Homemade Blackened Seasoning Blend recipe is spicy delicious and is the perfect seasoning for fish, meat, veggies, and soups. Here are some great shrimp dishes that are just begging for this seasoning! Homemade is so much better…. I didn’t have a recipe for something like this so IM so excited to make it! I have several ideas how to use it! Thank you, Michele! I’ve tweaked it several times and finally decided this was our best yet. We love making our own spice blends. This one sounds wonderful for salmon! Thanks, Debbie! It is great on seafood! I love putting it on shrimp too. Thank you, Loretta! Making our own blends has sure spoiled us and I found that I was remaking them differently because I would lose my chicken scratches so on the blog it goes!. I found that little jar at an antique shop that I need to stay out of! I like spicy and seasoned food and your blend would suit me just fine. I try to avoid blends with salt as I really don’t miss it. Thank you Judi! I think they use a lot of salt because it’s cheap and people mistake it as flavor. I always make my own spice blends–I’m a bit of a control freak :). But I’ve never made my own blackened blend. I love all the flavors going on in here so I’ll have to try it! Thank you Kels! I guess I’m kind of a control freak too LOL! I think they’re full of cheap ingredients like salt too instead of the great flavorful spices. I don’t usually use the blackened blends because I find they overwhelm the flavor of food. This one sounds good. I agree with you Liz! My husband uses a lot of heat but I like a little more of a balance. Thank you, Sonal! A great compliment from the queen of spices! Thank you Julie! I totally agree with you! Wonderful spice blend. I often don’t buy spice blends because I am so picky and love the idea of making it to taste. It sounds delicious! Thank you, Suzanne! I totally agree with you. They taste about 80% salt most of the time.